Email Monitoring - Send important alerts by email. External Logging - Send log messages to a remote syslog server. 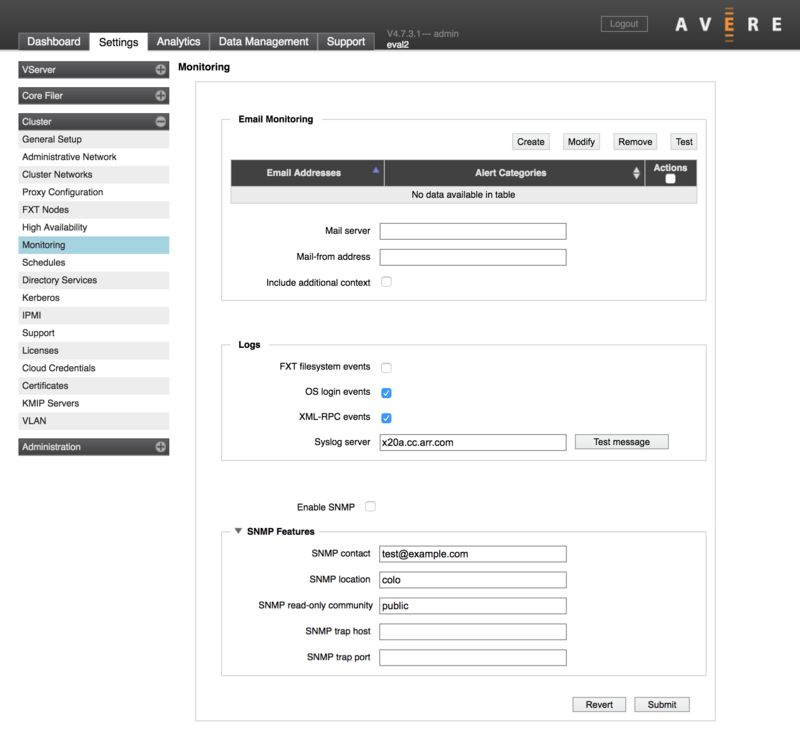 SNMP Monitoring - Allow a remote monitor to query the cluster to gather statistics and other messages, including alerts. This option can be used to generate SNMP traps. Click Submit after making changes, or Revert to go back to the last saved configuration. The cluster can send event messages to an external syslog server. Use the Logs section of the monitoring page to specify the server and to set options for what is logged. Check the boxes to select the type of events to send to the external log. All of these options are enabled by default if you specify a remote syslog server; most administrators should consider disabling filesystem event logging to avoid excessive traffic. 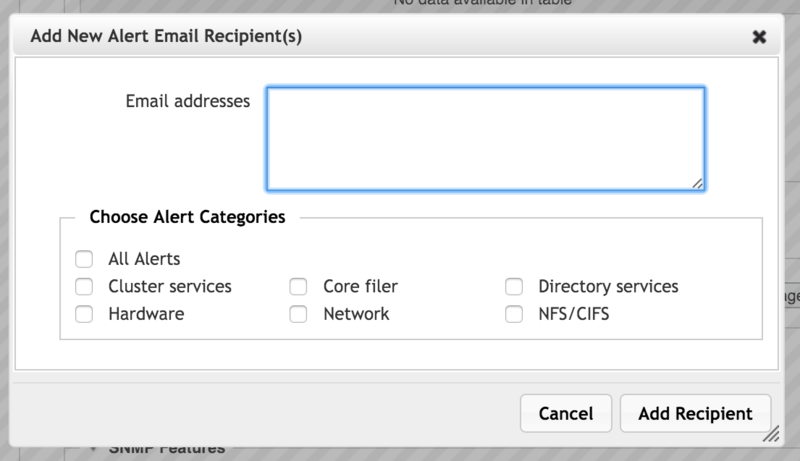 FXT filesystem events - Forwards FXT filesystem messages to the remote monitoring server. This option generates a high volume of log entries. Note that this option does not log all filesystem events (it does not log user filesystem access); it logs a subset of administrative and debugging traffic. XML-RPC events - Forwards detailed API call logs, including failures, to the remote monitoring server. XML-RPC events now include the username, remote IP address, method name and arguments (with sensitive values masked for security), and results. Some routine XML-RPC events (frequently invoked through the Avere Control Panel) are not logged. The table below gives the log facility and level for each configuration option for use in syslog filters. The Test message button sends a short message to the remote syslog server so that you can verify that the server is receiving information from the cluster. Click Submit to save changes, or Revert to abandon the new settings.